&Stitches: Sharing is good: a pattern giveaway! Sharing is good: a pattern giveaway! If you have seen the first issue of &Stitches you surely noticed Paloma Nunez Regueiro's sweet embroideries. Some even may have thought her cute 'Sharing is good' pattern was included in the e-zine. It isn't, but you can purchase one here in Paloma's Threekitchenfairies shop or....leave a comment for a chance to win the 'Sharing is good' pdf pattern! You could also do both or buy one of Paloma's other beautiful patterns. This is my personal favourite. Thank you Paloma for making this neat giveaway possible! We are giving away three 'Sharing is good' pdf patterns! And because Sharing *is* good, we would love you to share with us in your comment what features you'd like to see in &Stitches e-zine! Comments close this Friday the 20th of January, 20.00 CET. Be sure to leave an email address, if we are not able to contact you we will draw a new winner. Good luck everyone! Comments are now closed, winners will be announced later today! I'd love to see lots of tips on how to choose which thread and stitch to use for each area of a pattern, there are so many drawings that are potential stitchings but backstitch and straight stitch on them get boring after a while! I love the mag so much. I actually really liked Carina's felt project, so more of those sorts of things would make me very happy! Maybe also every issue an unusual type of stitch, just to keep us on our toes! I think how to's about stitches and tracing etc would be great. I love the first issue! I like Anne's idea about tips and suggestions for embellishments. I find that they often don't occur to me, and that's probably because I'm a novice and not yet practiced at adding to the original pattern. I am thinking some "how to"s would be great for us beginners. Additionally, maybe feature some fellow bloggers. That would be great. I also would love to see different kinds of stitches. I use a split stitch a lot and need to break out and do something different! LOVE THE MAGAZINE!!!! Love the ezine! I am planning to stitch the fishes soon! I would just say keep up the good work and continue to offer stitch how-to's on stitches we might not be familiar with. 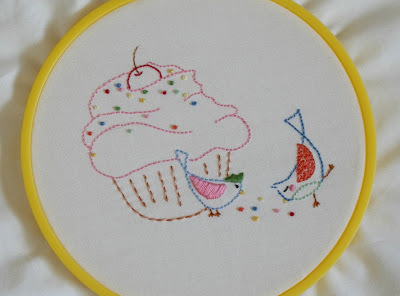 I had eyed the cupcake and birdies pattern also so I think it's great you're offering this giveaway and hope I am a lucky girl!! Great ezine! I would love to see a tutorial on how to fix what you are doing wrong (eg: If your lazy daisies are all pointy, you are doing this wrong, and here is how to fix it. If your French knots are not uniform, these are the possible issues, etc). I adore this pattern. It would be so cute stitched up onto a vintage baby pinafore. I'd like help with transferring markings! As a beginning stitcher I would also like some tips on how to transfer dark enough to see it, but not so dark you have to use all 6 strands to cover it up. I would also like to see different blog or book reviews! I confess that I've not seen the eZine. But, I'm on the verge of dipping my toe into the embroidery world. I just haven't made the plunge yet. This pattern looks too cute and makes me want to jump in all the more. Thank you for a chance to win! 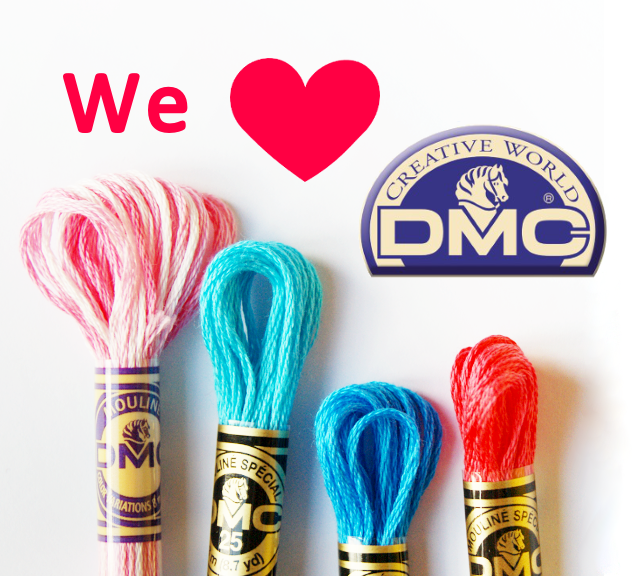 Love the Ezine - I would loveto learn some more unusual embroidery stitches and projects to use them. I would like to see articles on the History of Embroidery and also articles featuring Embroidery artists from around the world. A feature on how to transfer designs onto fabrics would be great! I love to see color combinations and patterns. I have not yet seen this magazine but that has to change. hehe Looks like it's something that I should be reading. I belong to an embroidery group but feel that there is so much to learn. Like the other comments, I'm interested in what's the difference between the different flosses. Is one better than the other? Different ways to mark your pattern and of course the different stitches.